Not many San Diego rock singers have the stage presence and sense of theatricality that Jac posseses. On a new six-song EP, the hard-charging Jac combines classic rock, '70s glam and prog rock into something both timeless and immediate. Old-school classic rockers will hear the traces of Humble Pie and the Stones, while those with younger ears will appreciate the alt-rock influences. 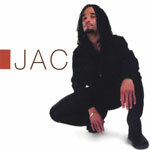 Jac's stage personna is so strong that even on CD, his personality is as dominant as his singing voice. Which is saying something, because he's got a powerhouse set of pipes. But rather than just bellowing like many rock singers (think David Coverdale or Ronnie James Dio), he's got David Clayton-Thomas' ability to combine a strong voice with a nuanced delivery. He can also bounce into a nice falsetto, giving him another octave of range, as he displays to good effect on "Susie." All six songs were written by Jac, and all are nicely constructed, with a slowly buildiing sense of tension before breaking out into an anthemic chorus. His backing band is solid, providing a firm foundation for his vocals.